It should be a cakewalk for Venkaiah Naidu against the Opposition candidate Gopalkrishna Gandhi as the BJP has numbers in its favour. 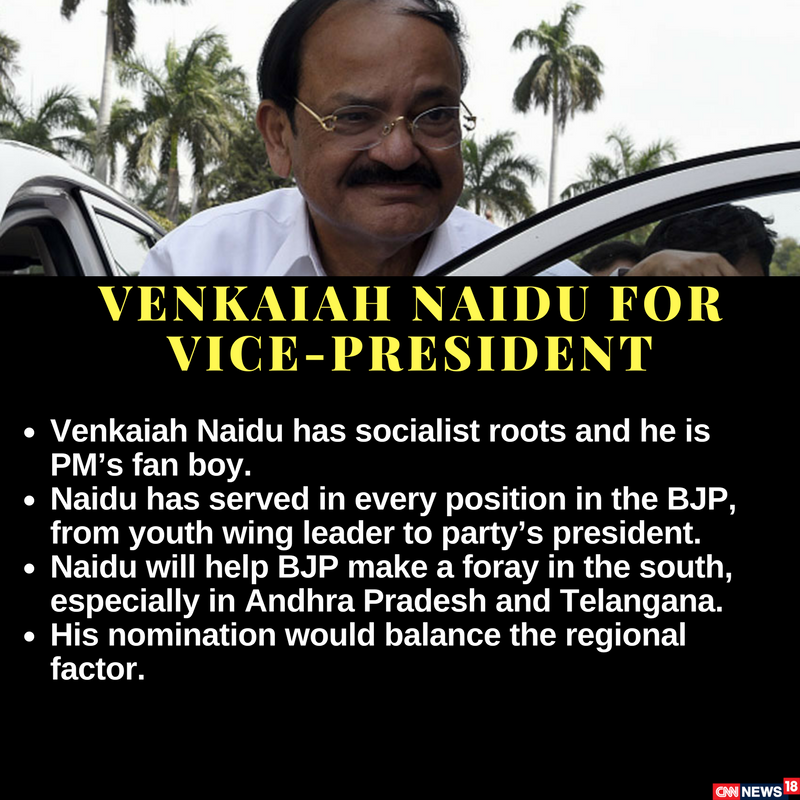 New Delhi: Union minister Venkaiah Naidu was on Monday picked by the BJP as its vice-presidential candidate to take on the Opposition's nominee Gopal Gandhi. 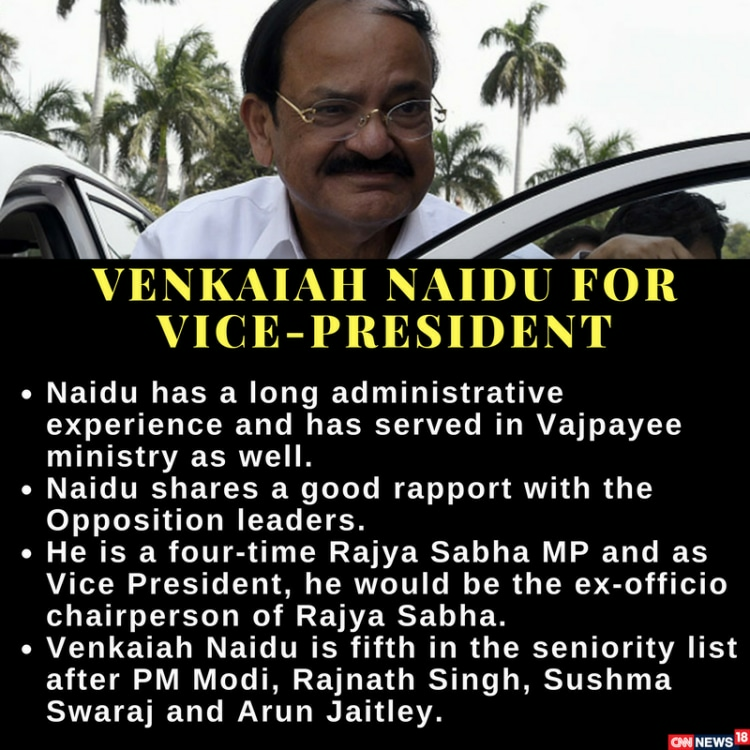 "Venkaiah Naidu has a lot of experience. There were other candidates in the fray, but we have chosen him," BJP president Amit Shah said after a meeting of the party's parliamentary board made the decision. Recounting Naidu's rise through the party's ranks since he was a junior worker, Shah said, "He has been with the BJP since he was very young. He hails from a farmer's family and held important organisational posts in the party." Shah also said BJP's allies in the National Democratic Alliance have welcomed the nomination of Naidu. Even before the official announcement it was speculated in the media that BJP would pick its veep candidate from the South. The names of Maharashtra Governor Vidyasagar Rao, Tamil Nadu MP L Ganesan and Kerala's O Rajagopal were doing the rounds. But things were reportedly sealed on Sunday evening when Shah called up Naidu and told him he was the party's choice. It should be a cakewalk for Naidu against the Opposition's candidate Gopalkrishna Gandhi as the ruling combine has numbers in its favour. As long-time parliamentarian and former parliamentary affairs minister, Naidu has a thorough understanding of rules of business and tricky House procedure. This will help him control the Rajya Sabha where the ruling bences are fewer. There are also other reasons why Naidu got several ticks on the BJP's check list: He is acceptable to many allies and even Opposition members; and he is from the South, where the BJP now seems to be regaining the negative perception that it's only a Hindi belt party. Only MPs are eligible to vote for electing the vice president. Of a total of 787 members from both Houses, according to NDA's calculations, 527 are already on its side. The BJP and allies have 426 members and parties like the AIADMK, BJD, TRS, YKP, PMK and AINR Congress together have 101. Voting for the V-P elections will be held on August 5 and counting of votes will be held the same day.